A few years ago, a number of cricket matches were washed out because of rain. Rains which came down when matches were in progress made the umpires call off the matches and in the two competing teams shared points In the end. But, a decision to have the two teams share points could affect both teams negatively or positively depending on their positions on the table. This led to an introduction of the D/L (Duckworth/Lewis) method of resetting targets in interrupted one-day cricket matches (50 overs) by Frank Duckworth & Tony Lewis. They set up The D/L method of resetting targets in rain-affected one-day cricket matches. The method was put on trial successfully during 1997 by the International Cricket Council (ICC) and adopted the following year. Since then the system has continued to be used worldwide and it has proved to be the best way to determine a winner in a rain affected matches. But almost 20 years into the adoption of the system, Kenya’s top cricket association, the Nairobi Provincial Cricket Association (NPCA) is yet to adopt the system. Failure to adapt to the system has affected most of the teams in the past in their 50 over competition but this weekend, it seemed to have hit title hopefuls Swamibapa hard. Swamibapa who were favorites against Nairobi Gymkhana saw their chances of bagging their ninth victory of the season go up in smoke when the skies opened up at Nairobi Jaffery. Defending 286, Swamibapa were on the driving seat having reduced Nairobi Gymkhana for 150 for 5 with 13 overs to play before the umpires called off the match and awarding Swamibapa 12 points and Nairobi Gymkhana six points of the possible 20 points. With this, Swamibapa chances of reclaiming the title that has eluded them for years seems to have ended at least for now as they are 35 points behind leaders Kanbis and 31 points behind second placed Stray Lions. “It's very unfortunate that the match had to end this way because of the failure to adopt to Duckworth Lewis,” Swamibapa former opening bowler Peter Ongondo said. “It’s saddening that a league like the Coast Cricket Association which is not as competitive as the NPCA league can play under the system and yet Nairobi is still sharing points because of rain. Irfan Karim had led Swamibapa to the final total of 286 with 80 runs. Krishna Babu added on 48. Peterson Kamau was the pick of Nairobi Gymkhana bowlers with 3 for 53. Rushabh Patel had scored 56 to guide his team to 150 for 5 before it started raining. Elsewhere Kanbis continued with their heavy battering of their opponents this time scoring 377 against Ruaraka. Dhiren Gondaria and Nelson Odhiambo scored their second century of the season as the home team trounced Ruaraka by 214 runs. Odhiambo top scored with 144 from 131 balls while Gondaria posted 117 from 87 balls. The two got the scores to 216 after linking up with the board on 48 for 2. Odhiambo’s knock included six sixes and nine fours while Gondaria hit 11 boundaries and five sixes. Rakep Patel who dropped to number six added 63 from 55 balls. In reply, Ruaraka's Sagar Shah with 97 was the only batsman in Ruaraka lineup who could sustain the pressure that came from Kanbis’ bowlers. Anup Fulpher also scored a century as defending champions Stray Lions to an emphatic 184 runs win over bottom-placed Kenya Kongonis. After failing to win a place in their last match against third-placed Swamibapa after a series of poor show with the bat, Fulpher retained his place in the 1st XI of Stray Lions with a run a ball 106 as the visitors posted 312 all out with 10 balls to spare at Nairobi Club. In reply, Kongonis failed to cope with some tight bowling from the visitor’s bowlers as they were all out for 128 with Shem Obado picking up 4 for 28 from his 10 overs. 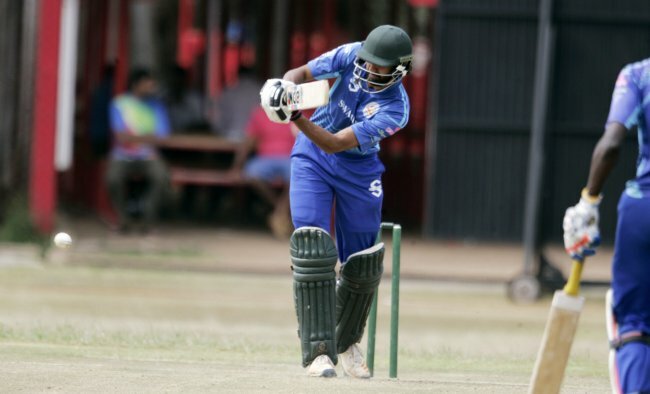 Coming into bat after Kongonis had reduced them to 11 for 2 in 17 balls, Fulpher shared a second wicket stand of 151 with Abraham Vadada in 28 overs. After the dismissal of Vadada on 68, Fulpher reached his maiden century in the 37th over before he was caught off Tony Ochieng in the 41st over. But before his dismissal, Fulpher had put on a second wicket stand of 49 with Collins Obuya. Obuya was more brutal on the Kongonis' bowlers scoring 60 from just 30 balls. He showed no mercy at all on the bowlers clobbering seven sixes on his way to the half century. In the chase, Newton Muthee (21) and Angad Kohli (24) were the only players that seemed to give a fight against Stray Lions bowling. With the loss, Kongonis continued being rooted at the bottom of the table while Stray Lions earned crucial points. Swamibapa (286 all out) v Nairobi Gymkhana (150 for 5) match abandoned. Kongonis (128 all out) lost to Stray Lions (312 all out) by 184 runs. Kanbis (377 for 6) beat Ruaraka (163 all out) by 214 runs.